What I thought was going to be a short five minute bus ride turned into an hour. I sat in my seat as my destination slowly drifted farther and farther away. I was definitely on the wrong bus. The bus meandered its way into a neighborhood I’d never been to before in Merida, Mexico, where I was studying abroad for the semester. It was the time of day where people were coming home from work, or from the market, or from wherever their day had taken them. Realizing it would be a while until I made it back to where I was headed, I settled in. The bus quickly filled with friends, neighbors, young, and old. One woman held a bouquet of flowers, another played with her toddler, making faces to inspire giggles. Within a few minutes, the sweet toddler had the whole aisle giggling. The sound of that infectious laughter is a memory that now stands out, an unnamed number of years later, because it was so incredibly simple. In my mind, travel had been a constant adventure, true excitement, a chance to “see the world,” but this moment helped me realize that everyone’s just livin’ life. Travel wasn’t about checking off the number of countries I’d visited, or going to the next hot spot, but instead it was about understanding how people live their lives, what’s important, what makes them laugh, and laughing alongside. Perhaps, it turned out, I was on the right bus after all. In fact, throw expectations out the window. Why do I continue to think things will turn out how I plan or expect them to? Leave it to travel to smack me over the head with this lesson, over and over again. As a study abroad advisor, this was one of of my biggest goals, to help students “manage expectations.” I would think about this, and encourage students to think about it, from the very first meeting. I’d ask questions like, “What do you envision when you see yourself abroad?” Because often the version in their minds was drastically different than the reality of a location, or the type of program they were considering, and that’s when there would be issues of students wanting to come home, or major stress would ensue, or they just wouldn’t get from the experience what they were seeking. And that is no bueno for anyone. See ya, expectations. For those of you (like me) who like to plan and for everything to be just so, this lesson is a scary one. But allowing yourself to let things happen in travel gives might just give you the perspective to know that when things don’t quite go as planned in life, you can deal. Although getting lost is harder to do these days than it used to be, with GPS at our fingertips, but maybe it’s even a good thing, sometimes. 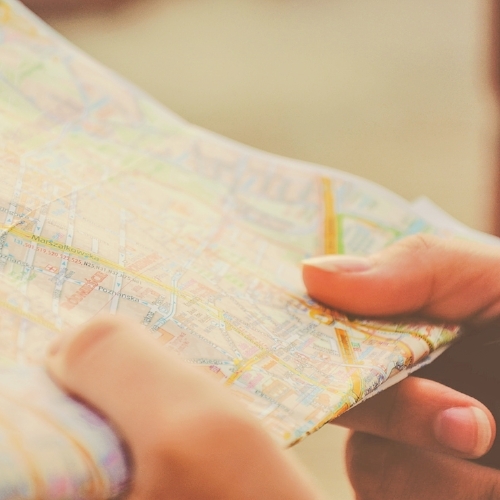 Getting lost may mean you have to ask for directions (gasp), in a language other than English (double gasp), but it also means you may stumble upon something unexpected in a really good way -remember lesson number one. Most likely you will find your way back again. And if not, you can just stay lost forever. Several people on the bus asked if I needed directions. Another time, in Ecuador, I fell in a hole. That sounds dramatic. What I mean is the hole caused me to trip, but this wasn’t a tiny stumble. This was a full on, one minute I’m standing, the next minute I’m on the ground, whomp. My hubby was right next to me, but he wasn’t the only one who came to my aid. There were genuine expressions of concern, not an ounce of laughter, and several hands held out. Thanks, strangers on the street in Ecuador. Thank you. Because it was embarrassing, and you offering to help made it a little less so. And it hurt a little. Anyway, the point being, there are many, many more people out there that want to help than those who want to harm. With all the craziness out there, it’s sometimes hard to remember or believe this one. But it has been my experience, and I hope is that you will find this to be true in your travels and daily encounters as well. Especially on days when I successfully avoid holes, I’ve learned I can pretty much do anything. Except I struggle with keys, and mechanical things in general, but that’s another story. When I reflect on what I’ve accomplished, I feel pretty darn good about myself. I’ve climbed mountains, taught a classroom of students, canoed through the rainforest, and biked through scary dark tunnels. And if I can do those things, then you definitely can. Plus more, probably. I’ve seen this especially in students as well. That is something I have really loved about working in study abroad administration. Watching the transformation of someone who is nervous to go abroad and who doesn’t think they can go abroad, and then seeing them come home, they are almost like different people. They become confident, able to problem solve, and often somewhat shocked at what they could do. And, you also might shock yourself at what you can do that you didn’t think you could. And we, as individuals, only take up a small part of it. But it feels smaller if we connect with one another. Why have I quit my comfortable university job to become a travel writer? I know, it seems so totally absurd when I say it out loud. It’s because of that moment of connection on the bus, and for the many more moments I want to encourage you to experience. And experience along with you. Maybe it’s a moment with a stranger on a bus, maybe it’s a moment with a loved one, or maybe it’s a moment helping someone. All I know, for certain, is that I was not thriving at that desk job, and I was not being my best self. So, here we go. To thriving. To meaningful moments on wrong busses.